﻿"I really liked the entire experience. All sessions were so informative and fun." Adrian College has created a unique partnership with Michigan International Speedway to create an opportunity for students grades 5-8 to learn about key concepts in nature near Onsted, Michigan. Our program continues to grow and change every year to incorporate more information about animals, water quality, invasive species, and the physics of the track. 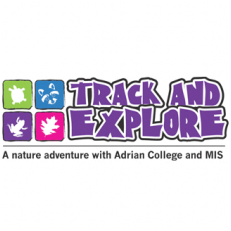 ​Our mission at Track and Explore, as a nature-based educational program, is to inspire future generations of students to explore and discover the wonders that science has to offer while maintaining a never-ending curiosity and an unwavering respect for the great outdoors, humanity, and all living things. Field Trip Grants from Target! Some of the best learning opportunities for students happen outside the classroom. National retail chain Target offers schools the unique opportunity to receive grant funding to help offset the cost of field trips! Head over to their website to learn more!! Each exploration is linked to key Michigan Education Benchmarks, as well as photos and key information on our animals, track, trail and water quality experiments. This website was created to provide an overview of what we offer through the Track and Explore Program. While nothing is a substitute for the true exploration experience of Track and Explore, we hope you can enjoy the activities provided. Teachers: feel free to use the lesson plans. Students: make sure to visit our "Students Look Here" page! We would like to thank the following organizations for their contributions to help Track and Explore provide field trips!